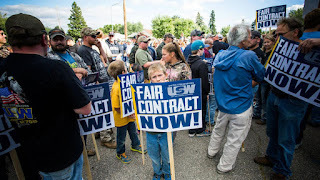 Hundreds of Steelworkers and supporters from across Minnesota’s Iron Range marched and rallied on Thursday as part of nationwide actions by the union as it fights concessions demanded by mining companies U.S. Steel, ArcelorMittal and Cliffs Natural Resources. The union began bargaining new contracts with U.S. Steel and ArcelorMittal in June. The two master agreements, which cover about 30,000 workers in all, are scheduled to expire on Sept. 1. 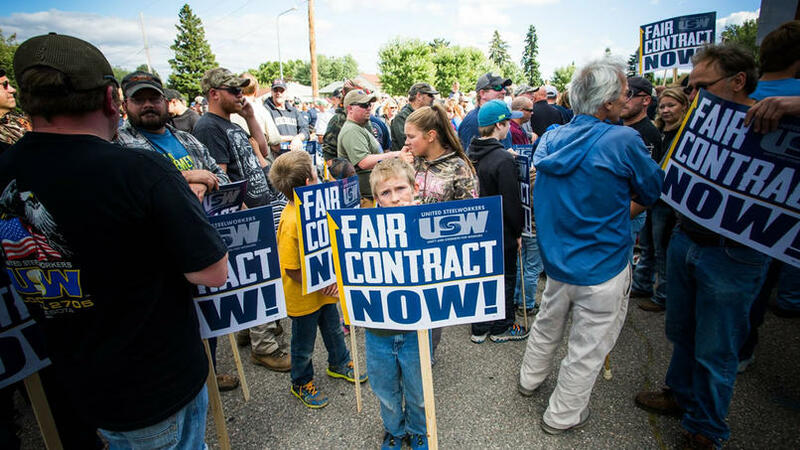 The contract with Cliffs Natural Resources, which is set to expire Oct. 1, covers more than 2,600 Steelworkers from four local unions in Minnesota and Michigan. In addition to the rally in Virginia, events were held in the Pittsburgh area; Coatesville, Pa.; East Chicago, Ind. ; Gary, Ind. ; Ecorse, Mich.; Fairfield, Ala.; Fairless Hills, Pa.; Granite City, Ill.; Lorain, Ohio; Steelton, Pa.; Warren, Ohio; and Weirton, W.Va.
"We recognize that this is a difficult time for the steel industry," said USW International President Leo Gerard. "But we also recognize that for generations, these have been good, middle-class jobs that have allowed workers to care for their families and support their communities. "It is important that we make sure that remains true for our generation and for those who come after us." > The article was written by Barb Kucera and is a slightly abreviated version of what was originally published on WorkdayMinnesota.